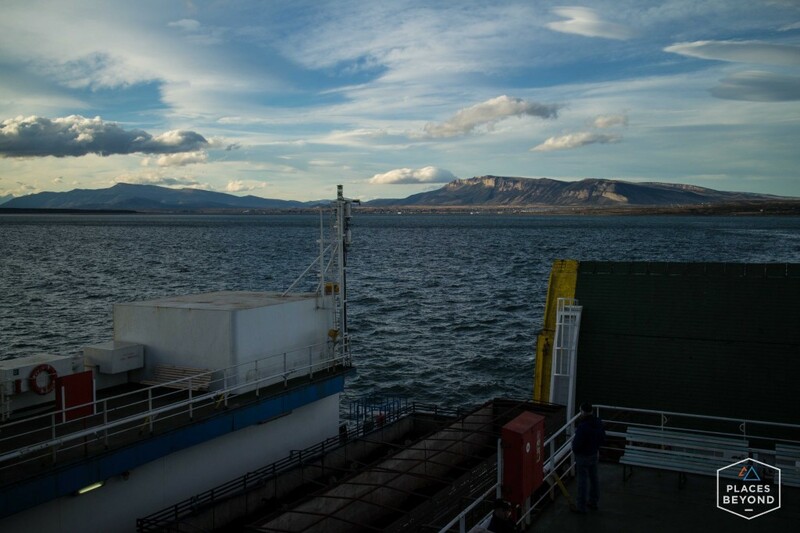 I took a few days to relax after the week of trekking in Torres del Paine and then boarded the Navimag Ferry in Puerto Natales. I wasn’t sure about this option because of the price but after reading a few others saying it was a highlight of their trip, I booked my ticket. 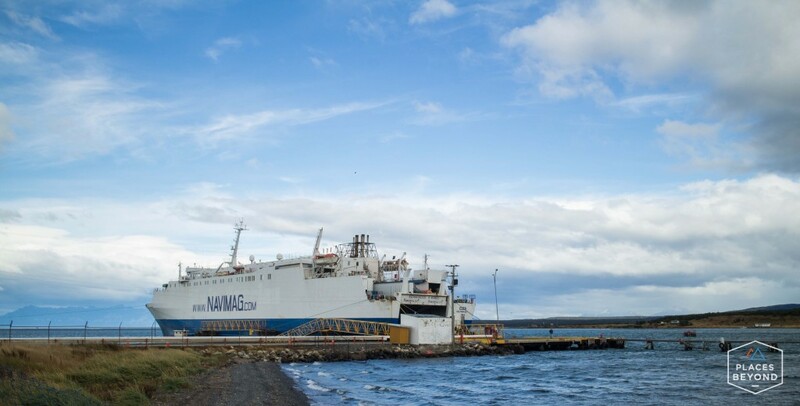 The Navimag would take me and my moto from Puerto Natales to Puerto Mont. 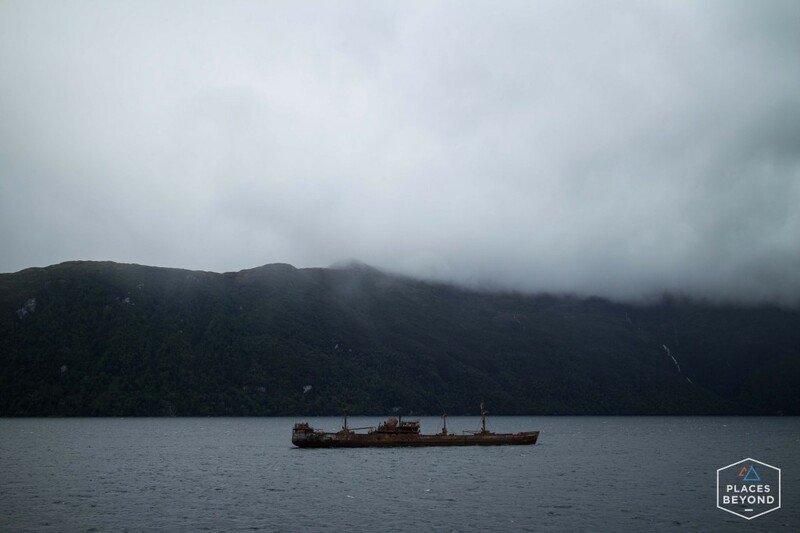 The route goes through the fjords of Patagonia and the views looked incredible. 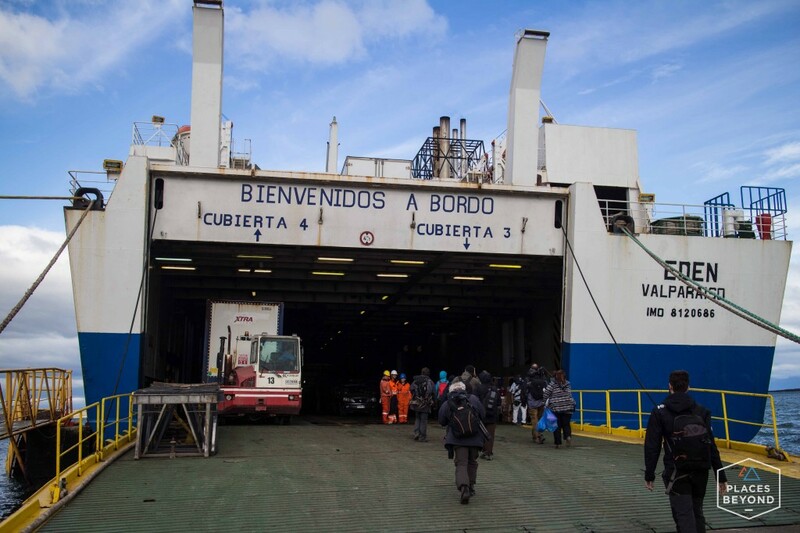 Navimag recently purchased a “new” ferry from Baja Ferries. This new boat is called the Eden. Riding into the cargo deck I was amazed to see how many levels for semi-trucks they had. Hydraulic ramps opened and closed to fill each level. Most of the other vehicles were commercial trucks. 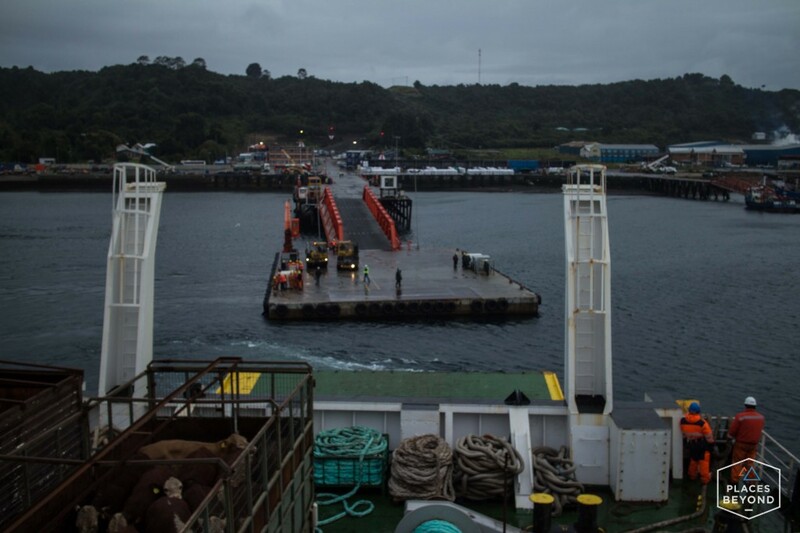 On the top cargo deck there were about 8 flatbeds of cattle. 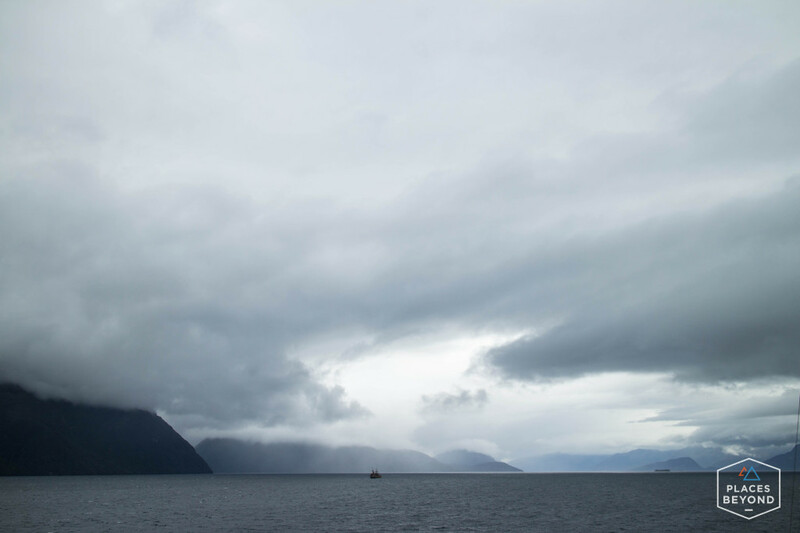 I boarded the bike on the surprisingly large ferry in the late afternoon. 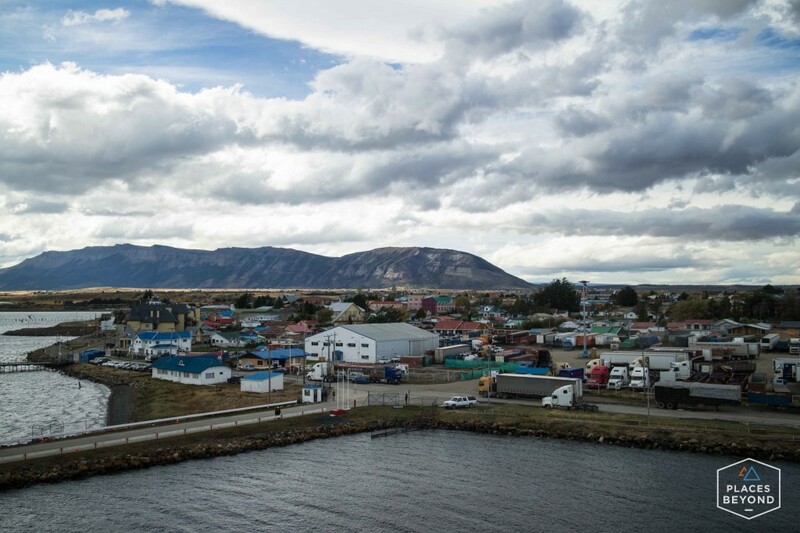 The wind was strong but the weather was gorgeous as we departed Puerto Natales. That was the last sun I’d see for 4 days. I might have had the worst luck cause not only was it heavy fog and rain the entire trip, I also had a brutal cold. I spent the days with a box of tissues and Halls by my bed as I watched movies. I shared a three bed room with an older French guy who’s been backpacking around. There were about 60 people in total on board. Many of whom were older travelers. But there was a group of about 10 of us who were younger travelers. We played a lot of card games before and after meals. I never get tired of meeting people from different countries and backgrounds. I hung out with some French, Swiss, Dutch, Australian, and Americans. I’d go outside on the deck to get fresh air a couple times a day but rarely could I see much of anything. There were a few minutes were it looked like clear weather ahead but it didn’t last. The fog had it’s own mysterious beauty though. I just wish I could have seen the sunrises and sunsets I’d heard so much about. We had 10 hours in the ocean where the boat was rocking back and forth. Luckily that crossing was at night so I was in bed and didn’t really notice it. But trying to walk to the bathroom down the long corridor required both hands on the walls to make sure I didn’t fall over. No seasickness though like when I crossed from Panama to Colombia on the Stalhratte though. Overall the ferry wasn’t the best experience for me but if I was feeling better and there was a little sunshine it would have been great. It ended up costing more than I expected which also added to the negative aspect. In total with the motorcycle it cost just under $600 for everything. The food was pretty good; on par with college cafeteria food, maybe better. Bring your own wine or liquor on board as it’s expensive to purchase from them and they ran out of wine on night 2. When we docked in Puerto Mont it was still raining. I wasn’t going to let the rainy weather and a slight cold to stop me from enjoying the weekend. I had a music festival in Santiago to get to! More to come about meeting up with Phil and Canadian Ian for a weekend at Lollapalooza Chile music fest. So while it wasn’t the best voyage it got me to Puerto Mont fast so I could make it up to the festival. And right now a big music festival is just what I could use, sick or not.